Is the Supreme Court Now Leaning Towards Bongbong Marcos’ Favor in his VP Electoral Protest? Bongbong Marcos served a manifestation of appreciation to the Supreme Court sitting as the PET and Omnibus Motion. He is stating in the manifestation that he is grateful for the PET’s decision. This is with the threshold not being the final determinant of the votes, with the ballot to still undergo appreciation to determine the true intent of the voter. Meanwhile, the culture of seniority at the SC is now back. This is as Chief Justice Teresita De Castro finishes her shortest term ever. Fairness can’t be alien anymore knowing that the blues now balances with the yellows. Marcos is also expressing gratitude for the PET for maintaining Rule 43 which states that marks that don’t reach 50% of the oval will not be considered valid votes. However, for the Omnibus Motion, BBM is asking PET to withdraw part of their decision to use the election returns as the basis for the segregation of the ballots at the recount proceedings. Because this is in opposition to a previous decision of the Supreme Court versus the Comelec in the Lerias case. In accordance with this, the Supreme Court says that the ballots serve as the strongest evidence and not the election returns. The Supreme Court adds that the election returns will only be used only if there are no ballots. With the ballots still there, it follows that the election returns shouldn’t be used. Consequently, Marcos asked again not to use the decrypted ballot images because they have been compromised. The PET has already said before that the decrypted ballot images will be used in place of the original if they are unreadable. The Supreme Court says that the decrypted ballot images serve as a functional equivalent of the original. This is also acting on the precedence of the cases Vinzons-Chato versus HRET and Maliksi versus Comelec. The PET further adds that BBM was not able to present evidence that the decrypted ballot images have been compromised. BBM’s camp, however, argues that these cases shouldn’t be used as a basis now because there is a difference between the images and the original ballots of the 2016 elections. This is regarding the squares that Smartmatic added to the ballot images. This shows that the images are not faithful reproductions of the original. With regards to the missing ballot images, BBM also expresses concern. The images from the VCM when taken are in a chronological order. Furthermore, each image has a sequence number that serves as control marks. However, it has been discovered that there are missing images on the first and middle parts and there are items added at the end. This shows as a clear indication of tampering. 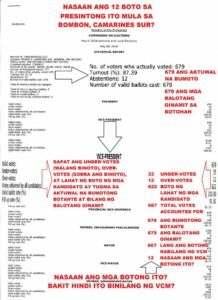 With the ballot images as the basis of the results, manipulating them equates to manipulating the elections. This is clear evidence that the ballot images are compromised. In Naga City and Camarines Sur only, there are 37,159 ballot images that have been compromised in this way. This was shown in a Senate hearing on July 31 however 2 months after and there still is no answer from Smartmatic or Comelec. Nevertheless, CJ De Castro’s one month stint in the branch’s highest office seems like making a difference. For one, the yellow atmosphere now becomes blue which is a symbol of peace and harmony that is in line with Marcos’ idealism for unity. Why Bongbong Marcos Must Not Allow Supreme Court to Use the ERs for the VP Recount? Atty. Glenn Chong’s questions the PET resolution, saying that the printed election returns will only be used in the initial cutting by ballot. There’s a big question at this point. The election returns or result of the election and the report or summary of the ballot and votes are both inspired by the single document only – the ballot images or image of the ballot that the machine took after entering the voter’s ballot in the VCM. 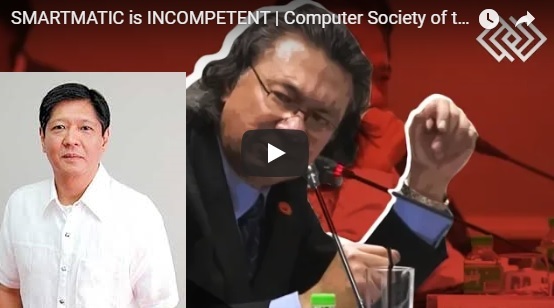 Mr. Edmund Casino of the Computer Society of the Philippines expresses his disgust over the decrypted images that prove to be not the replica of the original ballots. This alone he said is a violation of the election law. The Supreme Court recently rules to use the election returns as the basis of the recount after setting aside the threshold dispute. In the image is a report from precinct 17040010 in Bombon, CAMARINES SUR. This report will be visible to the of sections of this report from the machine and the explanations in these data. In the vice presidential contest, we can see all the votes read and counted by the machine (no one voted + so much voted + all votes obtained by all candidates) were 667 only. But according to the machine, there were 679 votes and 679 used ballots during the poll. Why 667 votes only were read by the machine? Where are the 12 votes that should be counted? The Supreme Court gag order is successful covering this up. See the report where the 12 votes have been placed. If it’s abstentions, it means the voter has no vote. It should be in the under-votes because there is no vote. But why place in abstentions? It’s clear that there is an ambiguous character or an un-clear mark that the machine does not know. The 5 % to 20 % of markings in the oval space actually serve as ambiguous marks. This is why the Supreme Court must not adhere to the 25% plea of the presumptive VP, Leni Robredo. The alien marking or a small dot (5 % to 20 % of the oval space) in the oval of the fraudulent candidate for the position to be deceived allows the machine to classify it as a vote for the cheater before it reaches the voter’s hand. When the voter voted any candidate in this position except the fraudulent candidate with a small dot (ambiguous mark) at the oval, the voter’s vote for the voted candidate is not counted even if the round-shaped shading area is marked. This is because there is an ambiguous mark in one of the candidates in such a position. 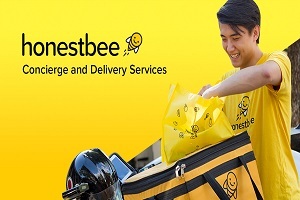 It will go to the abstentions. The Supreme Court must scrutinize this. But if the fraudulent candidate with a small dot is voted by the voter, of course, the mark will be made in the round-shaped shading area. It will be counted for the cheater because the ambiguous mark will be lost at the oval of this candidate. That’s just simple and logical for programmers. How many votes did get in this way? There were 92,509 ports that opened on the election day. Let’s say at least 12 each is in this nature and the average measure is 25 % (yes, that 25 %! ), it will reach 370,036 votes per precinct. It can definitely win the VP post! Using the ERs may speed up the revision process, or the identification of precincts, which show signs of significant anomalies. This would allow the procedure to be “more flexible and adaptive to calibrations of the voting or counting machines in the future,” the PET said. It points out that ERs could easily show discrepancies in the counting of votes, especially if the initial number did not match the physical count of ballots. 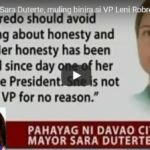 Robredo first questioned the rule in an April 5 motion The PET denied it in an April 10 resolution. Only when she filed an appeal did Robredo submit a copy of Comelec Resolution No. 16-0600d. It was dated Sept. 6, 2016, which served as the basis for her plea. Marcos opposed Robredo’s pleadings. The Office of the Solicitor General sided with him instead of the Comelec. SolGen Jose Calida agreed that the 25-percent threshold should be sustained. The Supreme Court said there was “no basis” to impose the 50-percent threshold. 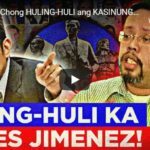 But, it maintained that when it drafted and approved the rule, it was “never informed of any official act of the Comelec” adopting the 25-percent threshold. Comelec Commissioner Luie Tito Guia did inform the PET about the 25-percent threshold on Sept. 6, 2016, letter. However, the tribunal said it was not given a copy. Robredo assailed the stricter 50-percent threshold supported by Marcos. She fears that this would disenfranchise voters who shaded their votes less thoroughly. 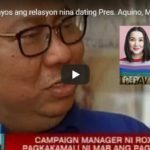 The PET also told Robredo that with the ongoing recount or revision proceedings, “there is yet no final deduction or addition of votes.” Robredo earlier noted in her motion for reconsideration that in vote counting at Barangay Laganac in Balatan, Camarines Sur where Robredo received 358 votes. Upon the application of the 50 percent threshold, a physical recount on the ballot yielded 346 votes for her. Votes for Marcos did not change in the tally. But the tribunal said that it would be “highly premature” of the Robredo camp to claim a deduction of votes at this stage. This can actually mean that the slight decrease can actually be massive after the many evidence of digital election fraud presented at the Senate. Former Senator Juan Ponce Enrile warns Bongbong Marcos that as long as Smartmatic controls the election, the Yellow’s dominance stays. 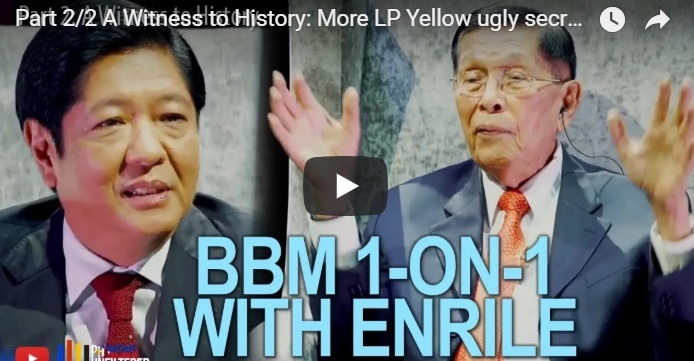 Enrile reveals that the late President Cory had no clue when it comes to governance. However, the people around her who are anti-Marcos made sure to consolidate power through the important branches of government by installing a revolutionary constitution. To this date, they still have a stronghold over the important branches of government including the Supreme Court. Meanwhile, Senator Antonio Trillanes IV, a known Yellow ally is now at the hands of the RTC. The court takes at least 30 days to resolve a motion. If the case is urgent enough, a judge can resolve it sooner. Judges Andres Soriano and Elmo Alameda, of the Makati Regional Trial Court, are under pressure when state prosecutors stormed to their sala. 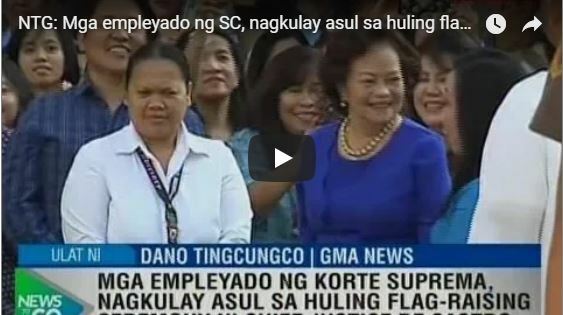 This is when the SC pushed Senator Trillanes’ petition back to the local courts. Proclamation No. 572 revokes Trillanes’ amnesty. It also orders his arrest for his role in the Oakwood Mutiny of 2003 and the Manila Peninsula Siege of 2007. It was dated on the 31st of August but was only made public on the 4th of September through a newspaper publication. Despite the presidential order, the rebel senator is still seeking refuge at the Senate. The Department of Justice then filed separate motions for the Judges of the Makati RTC to order Trillanes’ immediate arrest. However, the judges instead ordered a series of hearings. This is to allow both Trillanes and the state prosecutors to present their sides. The court’s proceeding allows a delay to the Senator’s arrest for at least 30 days. Judge Soriano granted interviews and welcomed reporters after the DOJ filed their motion. The judge did not grant the DOJ’s request to immediately file a warrant of arrest, instead, he gave 10 days to Trillanes’ lawyers to comment, and 5 days for the prosecutors to file their rejoinder. People can just sense the power struggle through these agencies. During an interview, Soriano acknowledges that Trillanes and the Magdalo group’s’ rebellion case was dismissed on Sept. 21, 2011. It was dismissed by Judge Ma. Rita Sarabia, to follow the amnesty that was granted to them by President Aquino. Nevertheless, this does not mean that Trillanes can escape the imprisonment. The debate on his military status is still ongoing that can dispute the court-martial proceedings. However, Soriano convicted First Lieutenants San Juan and Rex Bolo, as they did not avail of the amnesty. 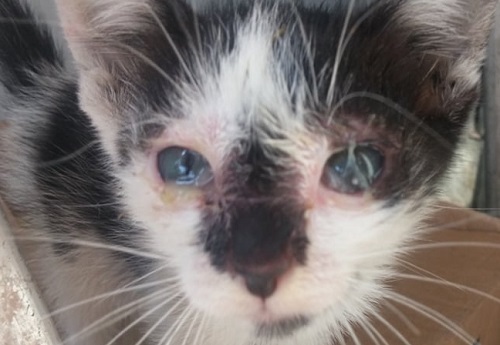 Consequently, the Court of Appeals cleared them both of their charges in April 2015. Furthermore, Soriano also ignored Justice Secretary Menardo Guevarra’s pronouncement that the government’s application does not need a hearing. All these developments are clear proof that there’s no way current President Rodrigo Du30 can be a dictator.